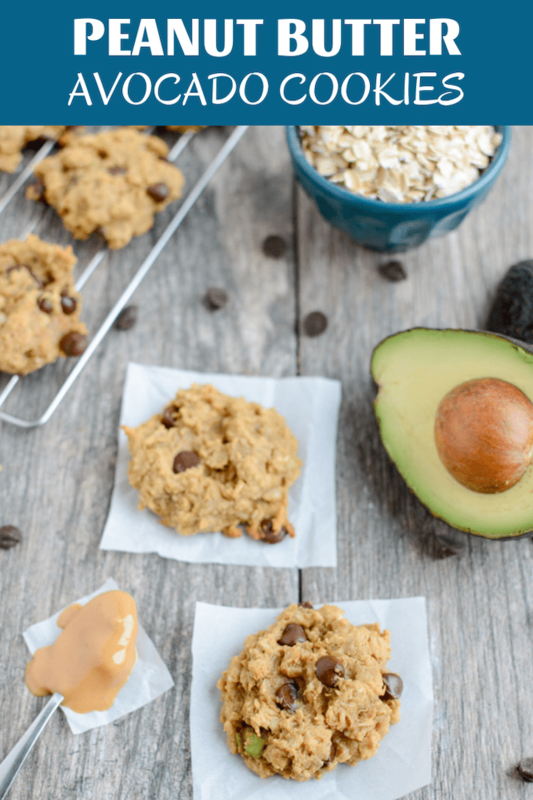 I’m resharing these Peanut Butter Avocado Cookies today because even though it’s been six years since I first shared them, I still make them regularly and love them just as much! They’re packed with healthy fats and a fun way to change things up from a regular chocolate chip cookie. Plus, I promise you can’t taste the avocado. Check out how easy they are to make! When I originally made them, it took about 4 tries to get them right. But now I’ve zoned in on the correct recipe and even my kids love them. I even entered AND WON a recipe contest with these little beauties several years ago! Scoop onto baking sheet and flatten slightly with a fork. These cookies are so simple even my toddler can make them! Be sure to try them out next time you have an extra avocado laying around! Let’s chat! Have you ever baked with avocado? « Should I See A Pelvic Floor Specialist? Funny, I just made a loaf of banana muffins with avocado and it’s SO good. I actually prefer it to any other healthy banana muffins I’ve made so far! These look absolutely delicious, I love the texture avocado gives to baked goods. Yum. These look so good! I haven’t thought to use avocado for baking, but now you have inspired me! 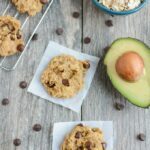 I’ve seen so many recipes lately for avocado pudding, but this is the first cookie recipe that I’ve seen – I’m an avo addict [according to my hubby] so we always have some in the house, I’ll have to try it! yes, please!!! I’ll give’m a try with some flax egg… a combination of all of my favorite things! I’ve been reading about how you can replace butter with avocado when baking, and it works really well. I can’t believe how simple your recipe is! Very cool! I just tried avocado for the first time the other day and wasn’t 100% sold, but I would definitely try them in a cookie! (I’d try anything in a cookie, let’s be real.) Looks delish! OMG these look awesome!!! I can’t wait to try them! Yay, I guessed correctly! I bet these cookies are so good. I’ve been thinking about trying a chocolate cookie recipe with avocado, this might be the push I needed! I love how simple this recipe is and that it uses zero flour and no added sugar! I’ve always been a little bit hesitant to add avocados into my cookies and other baked goodies but you’ve convinced me that I finally need to try it! Wowza avos AND peanut butter?! Be still my heart!! The bf will never know what hit him…I just won’t tell him what’s in it (he’s scared of ‘weird’ ingredients). Silly boys 🙂 These look awesome! 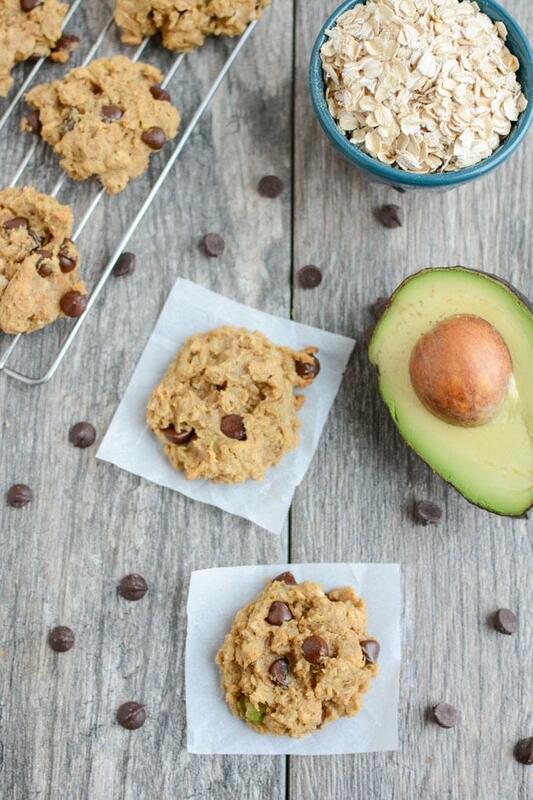 This is the second recipe I’ve seen for avocado chocolate chip cookies. So genius! I will be making these! Sometimes I really HATE my Low FODMAPs diet! Avocado is out, and so is agave. Bummer. This may have to be a Nick Only dessert 😉 Sounds wonderful. So creative! And I have a super ripe avocado on my counter right now that needs used – thanks for the recipe! I see so many interesting recipes with avocado these days!! I love it! Yay! I love that you didn’t use any flour and they can easily be gluten free with the right oats, perfect! Do you taste the avocado a lot? Or is it one of those flavors that blends into the background and it’s mostly peanut butter? I’m curious! Okay, amazing! I’m sending these to my brother. He will love them! I’m working from home today, and I’m nearly certain that these will be baked soon. How long do you think they stay good for since they are made with avocado? I’ve baked with avocado in muffins and loaves before, but never in cookies – looks genius! And I’m loving the super simple ingredients 🙂 Thanks Lindsay! Holy yum! I have been wanting to try a cookie with avocado. Can’t wait to make these! I never thought of this combo, but will definitely try it! TY! I saw your Instagram and had to high-tail it over here for the deets. Love this idea! I’d have never, ever guessed your “secret green ingredient” was avocado! Store day today so I’ll pick up a few more Avs. Mmmmm. Thanks for posting this! I’m making these the moment I get home! Before I walk the dog so they are nice and cool and ready to devour when I get back from walk ! Yum! Thinking I may use almond butter. Ha! So glad that you weren’t just teasing us! I’ve been waiting for this recipe to appear Lindsay… Pinning away! Thanks! YUM! I’m cursing my allergies now for not allowing me to eat avocado! Yessss. Avocados really can be used for anything! I cannot wait to make these! This looks amazing! Since I’m not a chocolate lover, I would definitely try them without the chocolate chips though. If I try them out I will let you know what I think! Just pinned these! Thank you! I love these Lindsay! I have a big avocado ready to go! i’ve been wanting to make cookies with avocado after becoming obsessed with avocado chocolate pudding. these look great! I love the peanut butter and avocado–I bet they’re suuuuuuper soft! I am eager to try these, but how would you store them… would they last a day or two? I love sweet treats but in only small amounts, hate to waste any extras. YUM! these look awesome! how did you even THINK of this recipe?! pinned! First Laura & now you – I need to get try more baking with avocado!! YUM! I have everything in the house to make these TONIGHT. Can I used rolled oats for this recipe? My word those look good! do you like sunflowerseed butter (sunbuuter)? or almond butter? What a great way to use up avocados:) what kind of PB did you use? What a great idea, so creative and super healthy.. can’t wait to try them out on my kids. Yum! These look wonderful 🙂 I love experimenting with cookies. Love the healthy fats in these and the no-flour aspect as well! Looks like a keeper!! These look delicious! I can’t wait to try them out. I need to make these asap. I have seen people use avocado in baking before, but I think this recipe has finally convinced me to give it a try for myself! I also love that these are vegan :). Just made these….I’m obsessed! I followed the recipe but used less chocolate chips and added some vanilla. I love how simple they are 🙂 fabulous! great idea adding the vanilla! glad you liked them! I’m trying out this recipe this weekend – can’t wait!! I made a batch of these last night – both my husband and I loved them!! Thanks a bunch for posting the recipe! I found the same recipe elsewhere, but they removed it. I use half avocado/half peanut butter. Comes out wetter, so I add another half cup of oatmeal. I found avocado honey, so that’s a bonus. I have an avocado tree, so double bonus! looks tasty! how long would they last and how would you store them? I LOVED these cookies! I’ve made them twice, and they were a huge hit. I posted on my blog about them. The post includes modifications, photos, etc. Thanks for the great recipe! Be sure to check out my blog. I just finished baking these and am tasting them right now. They’re so good! Thanks for this recipe, I’ll be making these a lot more now! I am totally making these! I really love this idea and can’t wait to try it! I love how short the ingredient list is, even with sneaking in some healthy fat! I never would have thought to combine avocado and peanut butter in one cookie. These were soo easy and delicious!! Thanks so much for your easy healthy recipes. Been following you for 3 years now. I am not good at baking but your recipes are so easy and come out great!! sorry, i don’t have that info! And, I wasn’t perfect in measurements. But, these were amazing! Thank you so much for the recipe. I found it through Pinterest and another blogger. ooh love the idea of making them chocolate! I love these so much. I’ve been making them for years and have it down to my own science, LOL. I always grind my oats, and sometimes I sub butterscotch chips for chocolate chips. Yum! [WORDPRESS HASHCASH] The comment’s server IP (66.155.9.111) doesn’t match the comment’s URL host IP (76.74.254.123) and so is spam. [WORDPRESS HASHCASH] The comment’s server IP (69.195.124.104) doesn’t match the comment’s URL host IP (141.101.116.165) and so is spam. [WORDPRESS HASHCASH] The comment’s server IP (66.155.9.140) doesn’t match the comment’s URL host IP (76.74.254.123) and so is spam. [WORDPRESS HASHCASH] The comment’s server IP (76.74.254.104) doesn’t match the comment’s URL host IP (76.74.254.123) and so is spam. [WORDPRESS HASHCASH] The comment’s server IP (72.233.69.94) doesn’t match the comment’s URL host IP (72.233.69.6) and so is spam. [WORDPRESS HASHCASH] The comment’s server IP (66.96.183.6) doesn’t match the comment’s URL host IP (66.96.130.96) and so is spam. [WORDPRESS HASHCASH] The comment’s server IP (97.74.24.117) doesn’t match the comment’s URL host IP (173.201.1.128) and so is spam. [WORDPRESS HASHCASH] The comment’s server IP (207.198.101.70) doesn’t match the comment’s URL host IP (76.74.254.123) and so is spam. [WORDPRESS HASHCASH] The comment’s server IP (66.135.48.188) doesn’t match the comment’s URL host IP (66.155.11.238) and so is spam. [WORDPRESS HASHCASH] The comment’s server IP (76.74.248.189) doesn’t match the comment’s URL host IP (192.0.80.250) and so is spam. [WORDPRESS HASHCASH] The comment’s server IP (66.135.48.166) doesn’t match the comment’s URL host IP (66.155.11.238) and so is spam. [WORDPRESS HASHCASH] The comment’s server IP (192.185.4.51) doesn’t match the comment’s URL host IP (192.185.34.109) and so is spam. [WORDPRESS HASHCASH] The comment’s server IP (50.87.144.63) doesn’t match the comment’s URL host IP (50.87.151.103) and so is spam. [WORDPRESS HASHCASH] The comment’s server IP (192.185.4.118) doesn’t match the comment’s URL host IP (192.185.54.183) and so is spam. [WORDPRESS HASHCASH] The comment’s server IP (72.52.202.8) doesn’t match the comment’s URL host IP (72.52.202.107) and so is spam. [WORDPRESS HASHCASH] The comment’s server IP (192.0.81.123) doesn’t match the comment’s URL host IP (76.74.254.123) and so is spam. [WORDPRESS HASHCASH] The comment’s server IP (184.168.27.101) doesn’t match the comment’s URL host IP (50.63.101.1) and so is spam. [WORDPRESS HASHCASH] The comment’s server IP (192.0.80.159) doesn’t match the comment’s URL host IP (192.0.78.16) and so is spam. [WORDPRESS HASHCASH] The comment’s server IP (192.0.80.200) doesn’t match the comment’s URL host IP (192.0.78.24) and so is spam.